Hogarth’s Wildlife Removal specializes in Vole eradication. There are several different types of voles in our Northern Michigan region. People often confuse them with with mice and/or moles. Voles are dark brown or black in color with grey or silver on the surface. They have small rounded ears that are hidden behind fur. 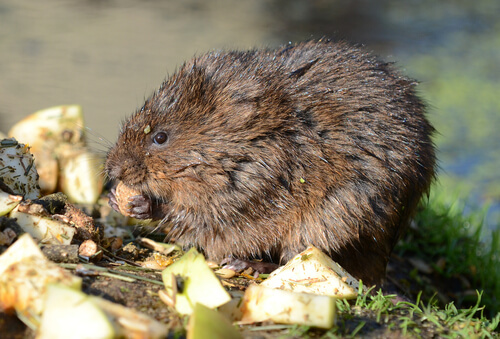 The vole is capable of mating year-round and can produce offspring up to 17 times in a year. On average, they have six young in their litter. Their home range is typically about ¼ acre of land with a single burrow system with several young and adults. They constantly groom these trails and leave grass cuttings along the way. They can be active at any time of the day, albeit they are most active at dusk and dawn. Voles are herbivores, meaning they only eat plants, and they are capable of finding food sources year-round. They feed on sprouting shoots in the spring, tips and seeds in the summer/fall, and roots in the winter—all of which can cause damage to your landscaping and trees. Contracting a pest control technician to place professional products in your yard is the best way to eliminate voles and other rodents from damaging shrubs and other greenery. If you have found evidence of these pests around your home, do not hesitate to give us a call.